Recently, I had this 22 year old come into to our clinic. And I won the lottery to see him. His chief complaint was a rash on right forearm that had been there about 2 weeks. This was his first visit for the issue, and hadn't had anything like this before and was worried. When asking about prior skin issues, he told me he looked up his symptoms on Webmd, and thought he had ringworm. So I take a better look at his arm, and it looked like a mild second degree chemical burn in a rather circular shape, with blisters on the edges. I made the mistake of asking how that happened. He told me: "Well that's the burn I got from the bleach I poured on my arm". "Well how else was I going to kill the ringworm?" Yesterday while trying to step up a curb and around a planter my foot caught on something and my brain decided that this would be a fine time to conduct an experiment where it would try to crack a concrete sidewalk by hitting it really hard with my forehead. The results of this experiment were predictable. The concrete was not impressed in the slightest whereas my forehead developed a bruise over a rapidly expanding lump which eventually grew to the size of Montana. The good news is that this experiment has now been done so there is no reason for anyone reading this to repeat it. I definitely would not recommend it. The bad news is, "now what?" I am not a big fan of going to the hospital however I know as soon as my wife sees my head she is going to insist that I go. I did consider wearing a hat for the next couple of weeks but she is always suspicious of anything unusual I do (which is just about everything) so I quickly realized that would not work. Bowing to the inevitable I turned myself in and as soon as she saw it we were off to Immediate-care. I am old after all and she thinks that I am fragile. Well (I think) I have this big painful knot on my head and I am mildly depressed about that. Also during my 50 years in retail I have often wistfully thought of harming others, but harming myself seems to be pretty counter-productive so I answer “No” and “No” to the lady at the reception desk. Let me warn you, if you are ever asked “The question” do not hesitate to answer it or try to joke about it. Otherwise you may find yourself in a room with a door that only opens from the outside while trying to convince someone that you are not a danger to yourself or others. This is not a huge amount of fun and it takes a long time. Eventually a nurse takes me to an examination room to ask me what this is all about, get my medical information, and ask “The question” again. Shortly after that the doctor arrives to ask me “The question” a third time. Then I have to do a bunch of calisthenics to prove that my brain and body are still on speaking terms which I apparently pass. At this point she tells me that everything seems fine but that I really whacked my head (I know, I was there) and I must go to the emergency room for a head scan to make sure, so off my wife and I go. Once there I am asked “The question” by the receiving clerk, the nurse taking me to the exam room and the doctor when he arrives, which I answer correctly all 3 times so I guess my brain is still at least marginally functional. I am asked to repeat the same calisthenics I did an hour earlier and then I get a free wheelchair ride to the scanner to see if my head really contains anything or is just a vacuum. Apparently all is fine. On my way out I am asked if I am in a lot of pain and if I would like enough drugs to tranquilize a rhino. I reply that it does not hurt all that much but I really do not like drugs, so no. They appear to be surprised and skeptical at my answer (Who turns down drugs? Why else go the ER?) but this is not enough of a reason to hold me so they set me free. Once we get home my wife informs me that for the foreseeable future I am not allowed to do anything, with the possible exception of breathing, until she is sure that enough time has passed that I am not going to suddenly die. After a day of pleading she relents enough to allow me to sit at the computer. So here I am posting just for something to do. 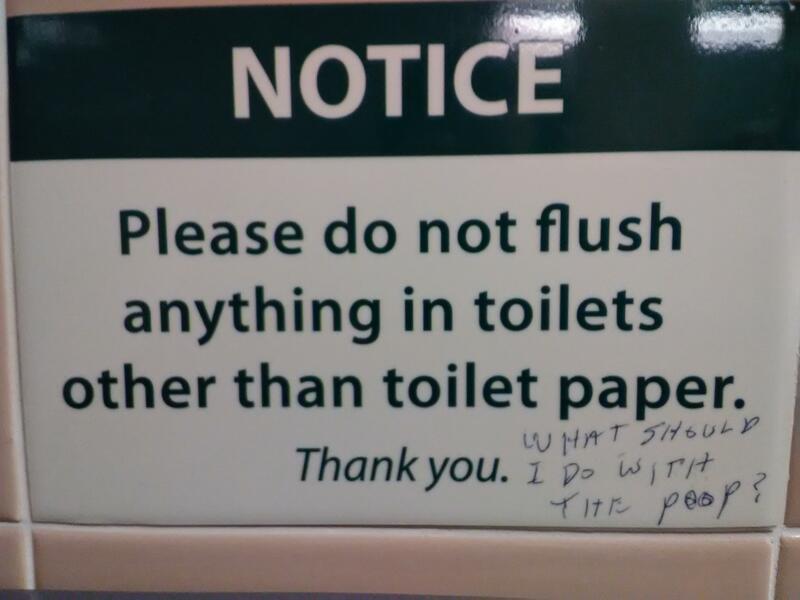 From RandenVanguard: Found this mad lad's handiwork in the local hospital bathroom.